The Thinky ARE-500 mixer from Intertronics is a high performance industrial non-contact “planetary” mixer that is suitable for all engineering compounds – liquids, pastes and powders. It mixes, disperses and degasses materials in seconds to minutes, in a sealed or lid-less container such as a jar, beaker, syringe tube or cartridge using a non-contact mixing principle which makes it possible to formulate compounds from very small amounts such as 0.5ml to large production scales up to a full 1.1kg, while mixing and removing bubbles simultaneously. 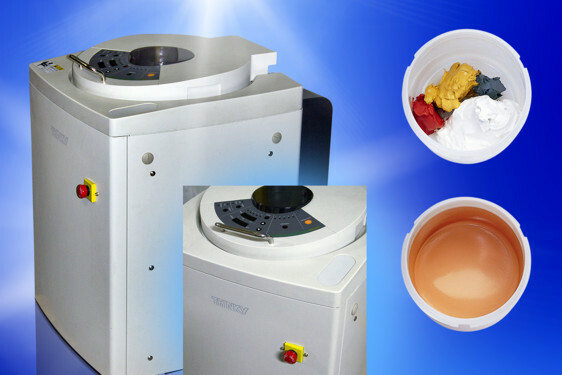 The Thinky ARE-500 conditioning mixer can be used for the mixing and/or bubble removal of epoxies, silicones, conductive pastes, medicines, laboratory or production chemicals, and many other fragile or complex materials. Typical mixing times are in the order of a few seconds to a few minutes, depending on material viscosities and complexities – a viscous epoxy resin and hardener can be homogenously mixed with aluminium powder filler in a few minutes, for example. The ARE-500 stores five different sets of mixing and degassing conditions (time and speed per mode) in a single batch cycle which consolidates otherwise time consuming formulation into a single step, completing in seconds to minutes what might otherwise take a great deal longer. Precise control of the mixing/dispersion process makes it possible not only to deliver improved and consistent formulation quality, but also to eliminate human errors and the need to rely on special operator skills. Shear forces are minimal so as not to damage delicate materials, whilst cooled or heated materials can be processed using special adapters. Standard containers range from 650ml jars right down to small syringes. The ability to mix in your own container eliminates the need to clean between batches, saving significant time and lowering costs, while improving yield rate. Thinky mixing and degassing has been found valuable for high viscosities, for materials with highly different densities, or for mixing dry particles into liquids. The simultaneous process of dispersion and degassing in one batch gives major time savings. It can remove voids and re-disperse filled materials in pre-packed syringes prior to use. The non-invasive processing eliminates any risk of cross contamination between batches. The ability to process quantities as small as 0.5ml saves wastage of valuable materials, while re-mixing of separated materials can prolong shelf life and save stock costs. The ARE-500 has a high-durability drive system suitable for production and enabling up to 500ml or 1.1kg of material to be simultaneously mixed and deaerated. Material possibilities include adhesives, sealants, moulding compounds, lubricants, slurries, coatings, inks, paints, abrasives, bio chemicals, cements, medical compounds, cosmetics/personal care materials, detergents, conductive pastes, dental materials, foods, construction materials or any other materials which are hard-to-mix or hard-to-degas. For further information please see www.intertronics.co.uk/thinky500 or visit their blog at www.adhere.uk.com – also see www.youtube.com/intertronicsadhere.